Learning cardiopulmonary resuscitation is an excellent way to provide yourself with the skills needed to help in an emergency situation. 325,000 cases of sudden cardiac arrest (SCA) are reported each year and if a trained individual is able to start performing CPR on an SCA victim immediately, the victim’s chances of survival increase by more than 40%. Additionally, four out of every five heart attacks in the U.S. happen at home, meaning the person you are most likely to perform CPR on is someone important to you. While CPR courses, like the one we offer here at Northwest Community College, show you all the correct CPR techniques, there are still some common mistakes made when applying them. We’ve highlighted the five most common mistakes here, so you know what to avoid. 1. Bending your arms – In order to apply the proper force to chest compressions keep your arms straight, but avoid locking your elbows out. Once you start performing CPR you will need to keep performing it until the emergency services arrive. By keeping your arms straight you can use your body weight, rather than your arm muscles, to perform the chest compressions, preventing you from tiring as quickly. 2. Stay above the victim – When performing chest compression make sure your shoulders are above the victim’s chest and you are not leaning off to one side. The aim when performing CPR is to push straight down on the victim’s chest, squeezing the heart and lungs between the sternum and the spine to keep the blood flowing. 3. Press hard – If your compressions don’t compress the chest by at least two inches then they won’t be effective. Many people performing CPR are afraid of damaging the victim’s chest or ribs, and so don’t press down with enough force. Such damage only occurs very rarely and it is far more important that the compressions are applied correctly. 4. Don’t lean on the victim – Allowing the chest to recoil fully is just as important as fully compressing it. 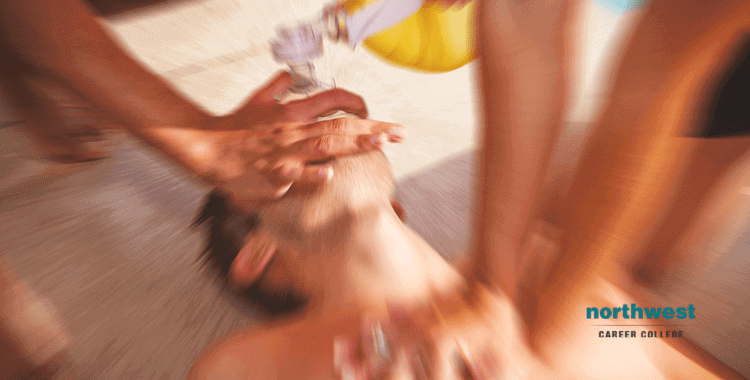 While not leaning on the person you are trying to resuscitate might seem obvious, the fact is that CPR is physically intensive activity that you might need to perform for an extended period of time. As you become more exhausted it is important that your chest compressions stay as crisp and technically accurate as possible. Here at Northwest Career College, we are committed to providing affordable, quality CPR Classes to the Las Vegas community. We pride ourselves on being an American Heart Association (AHA) testing center and we offer Las Vegas CPR classes designed to fit your personal needs and professional schedule. As part of our “student-focussed” approach to education we also off our CPR classes free of charge to all of our students. Call us today on (702) 403-1592 to book your CPR class and become qualified to save a life in just four hours! Previous Blog: Working As A Pharmacy Technician In A HospitalNext Blog: Why Train To Be A Medical Biller And Coder?